After his election as European Commission President on Tuesday (15 July), Jean-Claude Juncker can now start discussions with member states on how to allocate portfolios within his team. Below is an overview of all Commissioners already designated by their member state as well as presumed candidates. The bidding on member states’ nominees has intensified since Juncker was nominated by EU leaders at the last EU Summit, on 26-27 June in Brussels. After a failed attempt to designate the next European Council president and the High Representative for foreign and security policy, on 16 July, leaders gather once more on 30 August to break the deadlock. National governments have been asked to put forward names and portfolios that could suit them, leaving Juncker with several options to complete a complex puzzle, where individual experience is mixed with nationality and gender balance. At the time of writing, all countries but one (Belgium) expressed their preferences to the Luxembourger – on camera or behind the scenes – for the person to take on the commissioner role, and for specific portfolios. Germany: Günther Oettinger, the outgoing Commissioner for the EU’s energy policy, will likely renew his mandate. United Kingdom: David Cameron’s government was reshuffled on Monday 14 July, clearing the way for lord Jonathan Hill to become the country’s next EU Commissioner. Cameron had earlier proposed the Eurosceptic leader of the House of Commons, Andrew Lansley, for the Brussels job. The choice for the moderate pro-European Hill could put the UK in place for a heftier portfolio. Romania: The outgoing commissioner for agriculture Dacian Ciolo? is confirmed to renew his mandate, perhaps with a different portfolio. Austria: Johannes Hahn, the outgoing commissioner for regional development, will stay on as Austrian commissioner, perhaps with a different portfolio. Finland: Jyrki Katainen, the former prime minister, who stepped down weeks ago to take on a lead position in Europe, is Finland’s number one choice. Slovakia: The incumbent commissioner Maroš Šef?ovi? has confirmed his stay. Ireland: Nominated its (now former) environment minister, Phil Hogan. Croatia: Neven Mimica, the outgoing commissioner for consumer protection will extend his stay in Brussels. Lithuania: Appointed its health minister, Vytenis Andriukaitis. Latvia: Appointed Valdis Dombrovskis, a former prime minister. Estonia: Will send its former prime minister, Andrus Ansip. Malta: Appointed its tourism minister, Karmenu Vella. Italy: The Italian PM Matteo Renzi stood by his first choice, foreign affairs minister Federica Mogherini, who has been mooted to take on the role of EU foreign affairs chief, replacing Britain’s Catherine Ashton. Mogherini secured the backing of socialist leaders in July but faced fierce opposition from Eastern European and Baltic states at the July Summit. Bulgaria: Outgoing commissioner for humanitarian aid Kristalina Georgieva, from the centre-right, has a strong track record to lead foreign affairs over the next five years. She was designated by her national government, despite being affiliated to an opposition party and not the socialist party in government. France: Hoping to get the portfolio of Economic and Monetary Affairs, France has brought former finance minister Pierre Moscovici forward for the Brussels job. But the recent spats in president Hollande’s government has weakened the country’s bargaining position and Moscovici’s bid faces resistance from Germany. Poland: The six-largest EU member state and rising European powerhouse could get the foreign policy portfolio, for which its nominee, Foreign affairs minister Radoslaw Sikorski, is seen as an excellent candidate. Spain: The frontrunner, Miguel Arias Cañete, is former agriculture minister in Spain and has a good background to get the European agriculture portfolio. But Spain could still negotiate its way to the coveted Economic and Monetary Affairs portfolio with another candidate: Minister of Economy and Competitiveness, Luis de Guindos. Portugal: Nominated its secretary of state to the Prime Minister, Carlos Moedas, to take on the Brussels role. Czech Republic: Vera Jourova, minister for local development, was nominated by the government ahead of the last summit in July. Hungary: Foreign affairs minister, Tibor Navracsics, was nominated by the government. Sweden: The incumbent Swedish commissioner for home affairs, Cecilia Malmström, was confirmed to prolong her stay in Brussels. Greece: The Minister for Defence, Dimitris Avramopoulos, moves to Brussels. Slovenia: The Balkan country’s government sent a list of potential commissioners to Juncker, which contains two female candidates, most likely to get a decent portfolio from Juncker.? For four countries, the outcome is still unclear: Belgium, Cyprus, Denmark and The Netherlands. The latter three handed over a list of potential nominees to Juncker, a source confirmed to EURACTIV, but these lists are kept secret. Belgium: The country, which held national as well as European elections on 25 May, is still negotiating a federal governmental coalition. The Commission nomination has become a high stake in the national discussions, with three possible candidates: the centre-right, female MEP, Marianne Thyssen; the current foreign affairs minister, Didier Reynders; and the incumbent Belgian commissioner, Karel De Gucht. Thyssen is most likely to get the best portfolio due to her gender and her close ties to Jean-Claude Juncker. The Netherlands: The Dutch minister of finance and president of the Eurogroup, Jeroen Dijsselbloem, is still in the running, as is the minister for foreign affairs, Frans Timmermans. But the frontrunner as of this week is Lilianne Ploumen: a female, social-democrat minister for foreign trade and development. Cyprus: The frontrunner is senior MEP, Christos Stylianides, but the country has left Juncker with options. Denmark: Sitting prime minister, Helle Thorning-Schmidt, is a strong contender to lead the European Council, coming from a non-Euro country with good relations with the UK. This leaves the Danish nomination of a commissioner wide open, with several potential candidates. Bringing more gender balance to the European Commission was one of Juncker’s campaign promises, when he said that he would like to have “40% of the College of Commissioners made up of women” during the election campaign. As things stand, he is highly unlikely to make that target. When counting confirmed and likely nominees, the College now has four female nominees confirmed. Clusters based on budget ‘headings’? Talk of ‘clusterisation’ has been ongoing for a long time now. The Commission’s structural problems have urged EU pundits to explore a different form for the executive body. Commission portfolios could be designed along clusters reflecting the five headings of the EU budget. Accordingly, five Commission Vice Presidents will be responsible for these clusters. This article was updated on 26 August 2014, linking to the most recent version of the infographic. 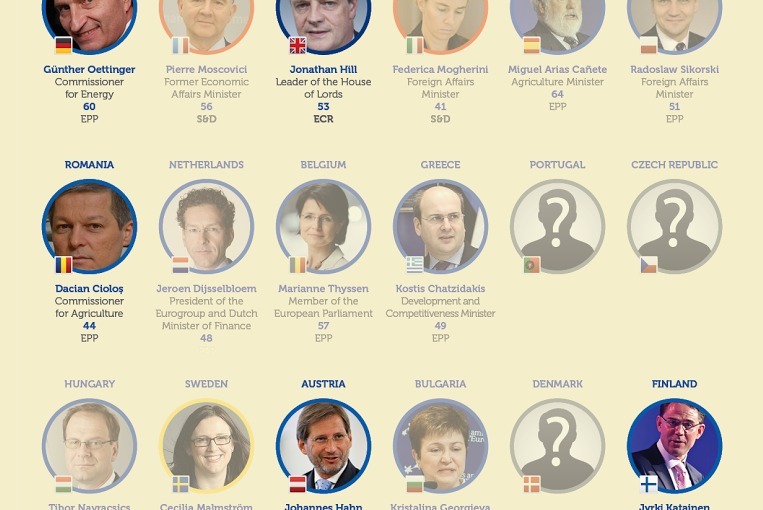 Infographic in PDF: Who's who in the new European Commission?